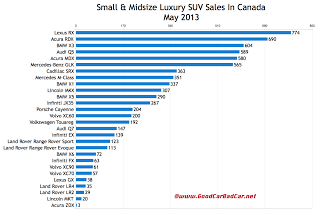 As Canadian new vehicle sales increased 5.4% in May 2013, sales of the Acura RDX, Audi Q5, BMW X3, Infiniti EX, Land Rover LR2, Land Rover Range Rover Evoque, and Mercedes-Benz GLK grew at an above-average clip. 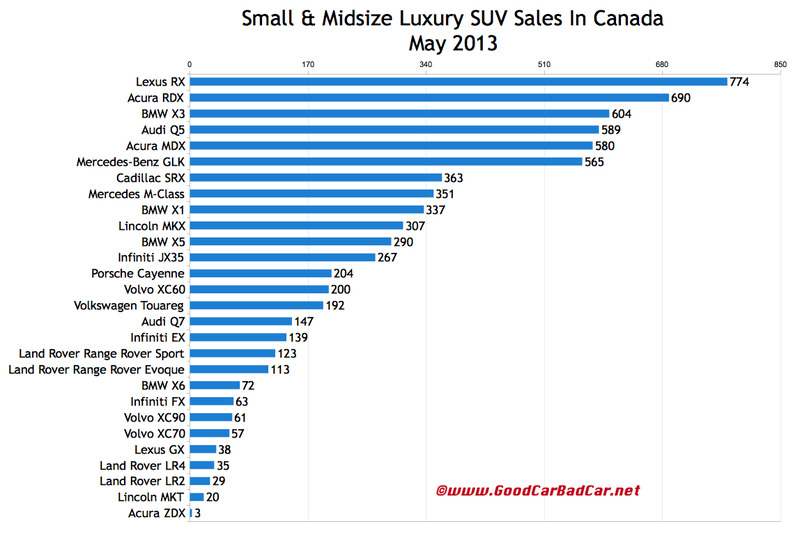 So did sales of the Cadillac SRX, Infiniti EX, Infiniti JX, both the Lexus GX and RX, Porsche Cayenne, and Volvo XC90. The bigger Infiniti QX56, Range Rover, and Mercedes’ G-Class and GL-Class SUVs did the same. BMW X1 sales, however, continue to fall. The X1 hasn’t posted a year-over-year increase since last July. The XC60, like every Volvo except the C70 and XC90, reported a volume decrease, the XC60’s fifth drop in six months. Big drops from Lincoln’s three utility vehicles contributed to the Lincoln brand’s overall 35% May 2013 sales decline. In eight consecutive months, sales of Mercedes-Benz Canada’s ML have fallen. This year, the GL-Class accounts for 9.3% of non-Sprinter Benz sales in Canada, up from 5.5% in the same period last year. The M-Class, meanwhile, after being responsible for 21.1% of Benz sales last year, now makes up just 14.3% of the brand’s sales. You can click any model name in the tables below to find historical monthly and yearly Canadian sales data. You can also select a make and model at GCBC’s Sales Stats page. These tables are now sortable, so you can rank luxury SUVs any which way you like. Suggestions on how GCBC should break down segments can be passed on through the Contact page. GCBC isn’t here to break down segments, an impossible task for any group, but to display sales data for the sake of comparison. The more ways sales data can be displayed, the better, right? This explains you’ll see the XC70 listed with luxury cars as well as with SUVs and crossovers and the Touareg with luxury SUVs and mainstream SUVs… because readers have wanted it both ways. You can always find the sales results for EVERY vehicle and form your own competitive sets by using the All Vehicle Rankings posts.